Prince of Wands – Adventurer! 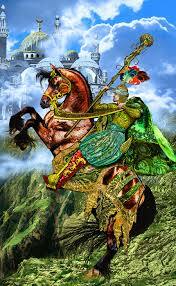 The prince of wands also know as the knight of wands depending on the tarot deck is a court card. Court cards are part of the minor arcana and can be very difficult to decipher as they can represent many things such as personality traits of the querent, the person the querent is inquiring about, various situations, and the elements of their suit. Princes indicate young adults and teenagers who tend to demonstrate strong emotions and action. The pricnce of wands can also portray a person who is a student setting out on an adventurous journey of education. When the prince of wands appears in a reading, it can indicate a personality such as the ones mentioned above or a desire to start some type of new adventure which presents itself quickly and may be risky. Even though success may not be assured, in this case, it would be better to take the risk than not because doing so will lead to a variety of experiences which include adventure and fun. When the prince of wands appears in a reading reversed, it may indicate that too many risks are being taken and that its time to slow down and consider your decisions more carefully. A reversed prince of wands also warns the querent to be careful because they may be dealing with people that want take advantage of them. 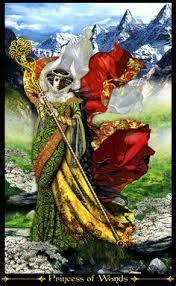 The princess of wands also know as the page of wands depending on the tarot deck is a court card. Court cards are part of the minor arcana and can be very difficult to decipher as they can represent many things such as personality traits of the querent the person the querent is inquiring about, situations, and the elements of their suit. The element for wands is fire. I will discuss court cards in greater length in a separate blog. For the most part, princesses possess a child like quality and represents youthful energy. Princesses can also represent the beginning stages of any energies geared towards projects, idea, or feelings, especially qualities of a young student. The princess of wands can indicate that a person is full of energy and eager to start some type of project rather it be personal or business. W hen the Princess of Wands appears in a reading, it can also indicate someone who is a loyal or even a student to name a few. In addition, the princess of wands can also be interpreted in a reading as impending news messages or announcements. When the princess of wands appears reversed in a reading, it indicates that the wands fire energy is blocked and can no longer flow freely.